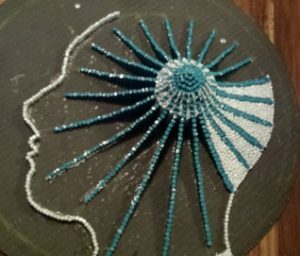 Last fall, Neurology Solutions Movement Disorders Center commissioned an art installation from a YOPD patient who creates mosaic art as part of his Parkinson’s management. 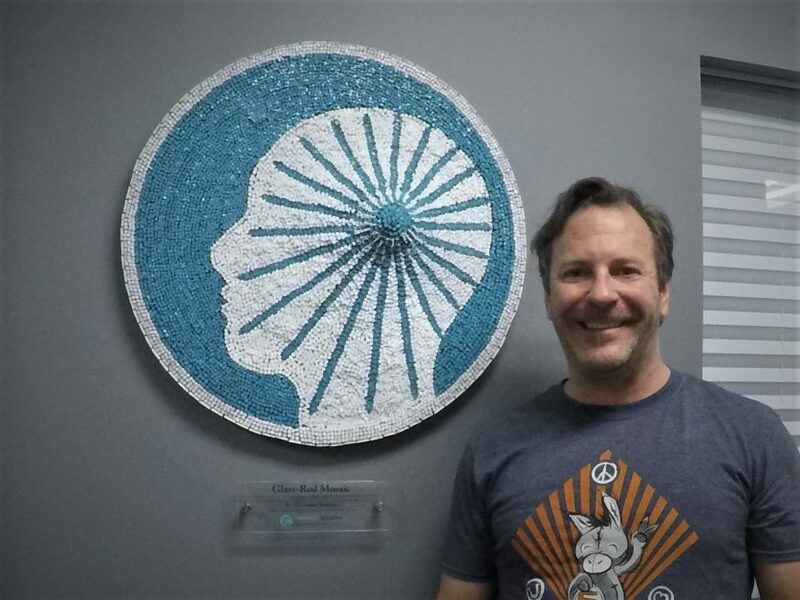 The patient, Alex Andron, unveiled the piece–a glass mosaic artwork depicting the icon in the Neurology Solutions logo–earlier this month in the Austin neurology clinic’s patient waiting area. We first introduced Andron on our blog earlier in the year. Andron, 44, describes himself as a “person with Parkinson’s, and a DBS miracle.” He was diagnosed with Young Onset Parkinson’s disease at 35 years old. After a period of years when he was largely in denial about his diagnosis, Andron began to seek treatment more aggressively. He underwent deep brain stimulation surgery (DBS) in Philadelphia in 2014 before moving back to Texas that summer. Following the advice of the Neurology Solutions team, and with the encouragement of family and community support, Andron rigorously pursued various forms of cognitive therapies, including Luminosity games, jigsaw puzzle building and mosaic building. Work in progress: Fourth and fifth slope section completed. He became a member of the Austin Mosaic Guild and says interacting with local professional mosaic artists has been enormously helpful. “I’m inspired to seek out mosaic work in the community, where I can apply my skills and possibly inspire others as well,” he said. The mosaic piece created for Neurology Solutions is a new medium for Andron. It uses glass rods that are cut to different lengths and glued and grouted to a wedi-board. Contemporary mosaic often capitalizes on the medium’s ability to add dimensions and texture. For that reason, Andron selected the center of the “star” pattern in the logo icon as the pinnacle, which adds depth and makes the piece a one-of-a-kind work. The piece, which is approximately 24 inches in diameter, features a graduated 3D effect, with the logo’s center at the pinnacle starting at four inches tall and sloping downward along the rays to a depth of 1/2 inch. When living with a chronic condition, setting goals is critical, said Andron, who worked as a Wall Street trader and portfolio manager before his diagnosis. Since then, he has discovered new talents such as art and writing, recently completing his first autobiographical book, No Limits. He recently launched Elevate Awareness, a non-profit that he hopes will inspire others with PD and other neurological impairments and showcase stories that highlight the possibilities for those experiencing limitations. Elevate Awareness’s first documentary will feature Andron’s expedition in August to the peak of Mauna Kea, a dormant volcano in Hawaii. He is spending three weeks training at elevation in Colorado to prepare for the climb, which he will make on a recumbent bike. Publishing his book and completing his first commissioned art project were other personal goals Andron has achieved. The art consignment for Neurology Solutions will help him in his pursuit of an art residency that will allow him to continue to explore the medium. Neurology Solutions is accepting new patients seeking a specialist in managing Parkinson’s disease, dystonia, essential tremor and age-related movement disorders. If you are seeking another opinion on diagnosing your condition or managing symptoms of a movement disorder, please contact Neurology Solutions or call 512-865-6310 to schedule an appointment. Stay informed by frequenting Neurology Solutions’ blog, or join Neurology Solutions Movement Disorders Center’s email list to stay up to date on the latest in treatments and how to manage stress, stay healthy and maintain quality of life while living with dystonia, PD and other movement disorders.